Larry Foss settled back into the armchair at Cowboy Coffee, and looked off into the distance recalling the years he’s spent preparing horses for parts in movies and TV shows. He’s trained them, trucked them, positioned them and their riders or drivers just right for directors of photography. He’s scouted locations. He and his crews have done live historical re-enactments notably the Billy Miner train robbery outside Kamloops. Larry ,who has a ranching background, is also a performer and producer. As one of the few working cowboys who’s also a member of ACTRA he knows what a director is looking for. shot of a rider on a horse. Now Larry will go try the horses or pick horses out of a herd. Then he auditions the horses being picked. 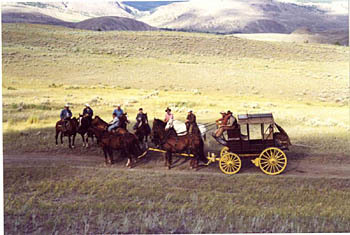 Ït’s not for every horse” Larry pointed out when asked about the 2002 Billy Miner re-enactment. Of the seventy horses which tried out, only fifteen were able to do the job. Horses which got the parts had to be both agile and calm. They couldn’t be frightened by the blanks being fired nor by the noisy, hissing monster they rode beside. During auditions the train was run back and forth past the horses to see how they reacted. These are multi-talented horses, Larry emphasized. They have to put on speed during the robbery then gentle down enough for children to pat them a few minutes later. The train robbery horses were being groomed for TV and movie parts so they were rotated. When it comes to gender, geldings are the most popular, for obvious reasons. Mares out of season are also used. There are exceptions. The Moscow Circus, for which Larry worked during its 1975-1976 North American tour, used stallions exclusively. Calmness can’t be over-emphasized. 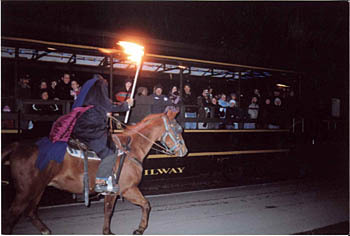 As the ‘Headless Horseman’ performing with the Kamloops Heritage Railway, Larry carried a torch with a live flame. A horse’s instinct is to flee from fire. Not only did his horse have to get used to a headless, black-caped rider, it had to accept the fire. It took persistent training to get the horse accustomed to fire. For his Headless Horseman routine Larry cut up a broomstick, covered it in mesh wire, put some old socks in heating oil, tightened them onto the broomstick and set the combination on fire. 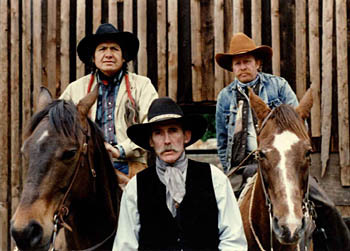 Larry hired ninety percent of the horses he supplied. “Most horses you audition are horses you don’t own. If you’re putting a lot of time in retraining the horses, you’re going to want to get the money for it. “ Depending on the contract, he will rent horses for thirty days, so much per day. There may be bonuses, like bales of hay or new shoes. Acting horses can wear out their shoes fast. Do horses enjoy acting? “Some do. It can be a problem if the horse starts anticipating, when it get so used to hearing “Action” that it starts moving before the director says to. It’s easy for human actors to hold back; not so with a horse if it’s hearing ‘Action’ forty times a day. It thinks it knows what’s coming and decides,” I might as well get going.” The director has to change to “Go!” to outwit the horse. Some problems can’t be anticipated; like the tough Western star who was allergic to horses. Since it’s just about impossible to find a non-allergenic horse, the answer is to thoroughly wash the horse, keep it clean, try to take the smell of horse away. Most of Larry’s professional work has been with horses. He did have that time with the Moscow Circus. Plus he set up a Kodak commercial with reindeer, and from 1994-1996, performed at the T.R. 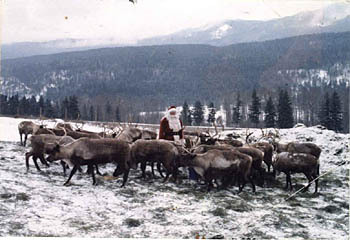 Reindeer Ranch north of Clinton, B.C. For the Kodak commercial, to be used during an American football game, the director first wanted four reindeer hooked to a sleigh, then changed his mind and wanted them running loose in four feet of snow at the location east of Revelstoke. Question was , what would they be running after? Larry rubbed their noses with grain and sent them out to follow his friend, Holly, a fast runner, who was carrying a can of grain. The film-makers got the shot they wanted. Now the problem was catching the reindeer. They caught three. The fourth wouldn’t come. “It probably thought this was its last chance for freedom. ‘Look at those mountains! What a view!’” Finally it rejoined the others. In April 2007, while auditioning a new horse, Larry was badly injured. “It was the wrong horse. I was trying it out to see if it could be used for the show train. I didn’t know it had been a race horse. It reared up and fell back on me.” It’s taken time and therapy but Larry’s ready to begin doing a little riding this May. He’s anxious to get back working as an entertainer, and animal co-ordinator. He can be reached at Box 1132, kamloops.